Trucks full of fluff. Stick figures so desperately wanting to jump. That should be enough to figure out what to do. 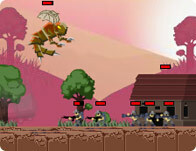 Drop your guys out of the helicopter while avoiding various obstacles. Each 5 saves, you'll find a new obstacle to avoid. 50 levels. Enjoy! Arrow keys to move, Spacebar to drop people. Run through a research laboratory and test your reflexes.